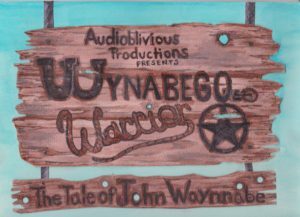 This week, we’re playing Wynabego Warrior: The Tale of John Waynnabe (*eagle screech*), the wacky western epic by Audioblivious Productions. John is a mysterious drifter who drives around the West(ern part of Kentucky) in a souped-up RV, righting wrongs. It’s a rollicking good time! Later on, I chat with Austin, who co-founded Audioblivious Productions and plays John in the show.